The safety of young children at public pools and aquatic facilities should remain a number one priority. There are many life threatening risks and dangers that could potentially occur even in the presence of parents and lifeguards, for example drowning. As a result, Pro-Visual Publishing is eager to announce its inaugural edition of the National Guide to Public Pools & Aquatic Centres into the vast collection of workplace health and wellbeing safety guides. The Guide is distributed free of charge to operators of public swimming pools, aquatic centres and water parks across Australia. This Guide contains vital and relevant information concerning the health and safety of young children in and around pools. Prominent topics featured on the Guide include active parental supervision at public pools and aquatic facilities, key requirements to prevent children from drowning, as well as sun safety. It is important to note that inadequate supervision is the most significant factor that contributes to young children drowning. In order to reduce or prevent any harm from occurring to a child, parents must never neglect to keep an eye out for their children, no matter if they are in the pool or exposed in the sun. If both parents and lifeguards uphold their responsibility, public pools and aquatic facilities will become a much safer and enjoyable place. 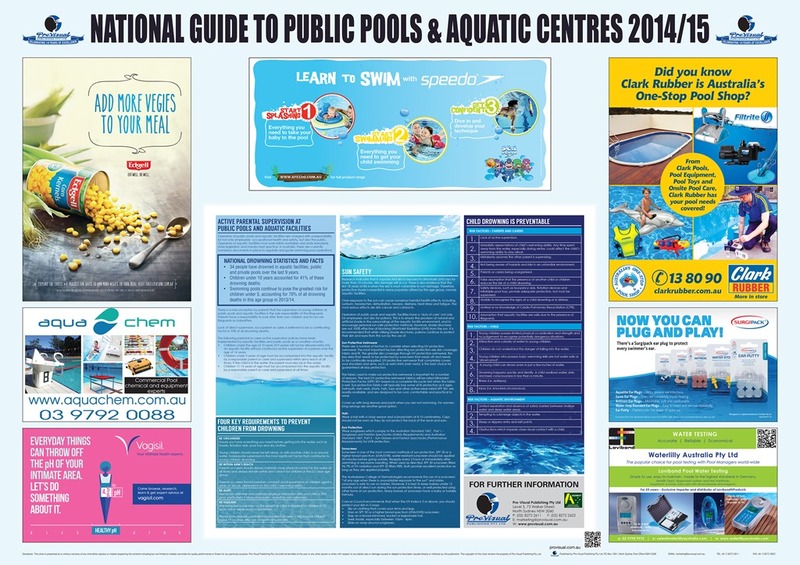 “I would like to thank all of the sponsors of the inaugural National Guide to Public Pools & Aquatic Centres 2014/15. Their support has made it possible for the Guide to be distributed free of charge” – John Hutchings, CEO, Pro-Visual Publishing.